However, now that I have found this section, I admit that the data are interesting! For example, who knew that last week, the top viewed page on this blog was my recipe for lupini beans?? Next is my recipe for rhubarb scones, which makes more sense since rhubarb is now in season! I don't have too much time to play with this feature since we are now in 'wedding count-down' mode with one week to go until my family starts arriving and less than two weeks to go until my older son's wedding. Are we excited?? Yes, yes, yes, but that was an easy answer! In the meantime, I'm going to have to check out my recipe for lupini beans and rhubarb scones. They might be very nice additions to the the food I am planning for the open house the morning after the wedding! Do you have a favorite recipe from this blog (or my website www.CancerRD.com) that you would suggest as 'finger-food' at a late morning open house? Let me know pronto so I can think about adding it into my thoughts at this time. I am planning on strawberries (lots of them) but also worried a bit that they won't be ready to harvest locally, so I am thinking of back-up plans that are not too much work because Martha Stewart is not showing up to 'take charge'! My husband spent the day at our 'city house' still sorting and clearing out the dribbles of stuff that seem hard to make decisions about 'keep or pitch'. I weeded the front sidewalk at the farm and then hauled the spading fork down to the garlic field to harvest the last of the green garlic of the season, not the intentionally planted cloves to be harvested early, but those where 2-3 cloves accidentally got planted together instead of just one. Growing too close together to produce full and nicely shaped bulbs later in the season, we dig up these two-sies and three-sies to consume as 'green garlic', a mild-tasting garlic and a briefly-appearing spring delicacy. We had about 10 pounds after cleaning, the vast majority of which will be headed downtown in the morning to several of our chef friends. However, we saved the smallest pieces and any that were injured during the digging for us to eat tonight. We cleaned the dirt/mud off the roots, chopped off the roots and the small amount of brown tips (only on the first leaf to emerge) and then chopped them up similar to how one would use a green onion, stem to stern, the whites and greens together. Here is a photo of the chopped green garlic along with a piece of a multi-grain baguette covered with hummus and chopped green garlic. We loaded up the green garlic over a vegetable pizza and figured our pizza might have had the equivalent of "5-A-Day" on our plates! Just for fun, here are my two favorite bird photos today, a female hummingbird getting ready to land on the hummingbird feeder and then when she was feeding on the feeder. I took these photos while I was sitting on our front porch this afternoon taking a break from the very hard work of digging green garlic out of the muddy raised beds while also keeping my balance in the wet and muddy paths and then hauling it all back to the garage in 5-gallon buckets containing water to keep the roots wet. The short way back to the garage (one leg of a triangle) was through waist high grass (maybe tomorrow it will be dry enough to cut) or the longer way back was over to the driveway and then up to the garage (two legs of a triangle). Either way, the grass is way too high and the ground way to wet to use our wagon to help haul the loads, so I made many trips to manage it without dropping or spilling anything! I am not complaining because all the trips back to the garage meant lots of breaks to see if I could get some great 'photo-ops'! Just a quick post this morning to tell you our bluebird again woke me up this morning, same place on top of the shepherd's hook, only this time he was singing. Singing, just a few feet away from me! You can see a photo and hear him singing at this website. He has been flying to the bluebird house. However, just as I predicted, he already has competition from a chickadee I have actually seen leaving the house. My friend Julie Zickefoose (I have suggested Julie's blog in the past) has already given me some tips for better mounting to keep the house predator-free (at least reduced risk!) and we will work on that. While reading Julie's blog last night, I was especially moved by her recent posts about the loss this year of a much loved old oak tree at the end of their driveway (There are 4 posts. I suggest reading them in order; I read them backwards, but I was still very moved by Julie's words and photos). Anyone who has experienced love, joy, and beauty will be able to relate to Julie's tribute to this tree and her grief. I also saw a quotation by EB White on Julie's blog that I had not read before. "I arise in the morning torn between a desire to save the world and a desire to savor the world. That makes it hard to plan the day." That is where I am right now! After reading this quotation, I was able to make some decisions late last night about what is pulling me versus what is pushing me. Spending much more time savoring the world is pulling me, and pulling me deeply. I have had these passages of change at other times of my life. It took a while to recognize them, acknowledge them, understand them, and then have the courage to act on that understanding. This needs to be a short post because so much else needs to be done today, so I do not have time to thoughtfully elaborate more fully. However, I again know that the universe unfolds and provides or leads me to what I need when I need it. As I continue my path, I will still be blogging because doing so gives me great joy. Thank you, Julie, for sharing that quote (The Trumpet of the Swan by EB White is still one of my all-time favorite books) and thank you also for sharing all your gifts with the world. There is so much joy to be found and experienced in our lives, and you are right, most of it is free! I decided it was time to replace the photo with the dreary sky heading my blog, even if it did have a great image of a gorgeous rose-breasted grosbeak at our bird feeders. We finally woke up this morning to blue skies, the first morning in a long time. And better yet (if possible), before even lifting my head off the pillow, I looked out the window to see a male Eastern bluebird sitting on top of the shepherd's hook that is holding the orange slices you can see in the new photo at the top of my blog. I never did get a photo of the bluebird sitting up there, but please try to imagine how stunning the image was. He was sitting right on top of the hook, with the oranges underneath him, facing to the right (west) with the eastern sun behind him just making his blue back sparkle and shimmer. Even when I bolted straight up in bed and woke my husband up with a yelp of glee, this bluebird did not move but (like other bluebird sightings I have written about after our dog Kaya died in January) just sat there and looked and looked and looked into the house as it appeared to be watching us. It did finally fly away, and at least once today, I saw it fly from the bluebird house we finally put up yesterday. I think we are late (like, what else is new?!) getting that house up this spring, but maybe not. I cannot say why that bluebird was looking in the window so long this morning, but I can imagine to myself that it was thanking us for providing it a home, if not for now or later this summer, then to use next year. However, the bluebirds will have competition. Chickadees also were looking at the house today, and I expect tree swallows with also take a look, so we will have to get all the bluebird houses up that we have tucked away somewhere in the garage. Here are photos of the backyard bird feeders and also a view of the bluebird house on a post (formerly used as one end of a clothes line, which we'll get re-established one of these days). We can see the bluebird house clearly from our bedroom window, and also from the barn porch, but the view from the kitchen window is obstructed by leaves that have finally emerged on the small oak tree. Do you recall the quote by Henry David Thoreau about the bluebird that I have used before in my blog? It seems particularly appropriate to use today. "The bluebird carries the sky on its back." I saw exactly that when I first woke up this morning. That does not happen every day! And it is raining again right now, so the grass and the weeds will just keep growing. The garlic is fine because it is in raised bed, but the fields are too wet to get our onions and leeks in the ground. There is nothing easy or guaranteed about growing food for our community. Another RD-Farmer friend reminded me today to make sure to stop and smell the roses. I assured her I do. Tonight I am smelling lilacs I brought into the house along with some lily of the valley and remembering how lucky I was this morning to wake up in time to the sky, maybe even a glimpse of the universe, on the back of a bird. We saw the sun today for ~ 30 seconds at noon today. It was dazzling! We have almost forgotten what it looks and feels like. Fortunately, even with all the rain, our basement is still dry and our garlic in its raised beds is still ok. Tomorrow we are supposed to wake up to sun. Even if it is forecast to be partly cloudy, that also means partly sunny! Woohoo! We won't know how to react, except unofficially, I expect a flurry of sickness to suddenly appear tomorrow as people somehow just cannot make it to work (just kidding!). So speaking of sun, tonight while catching up (haha!) on labeling photographs I have taken, I found 4 beautiful pix of a sunset way back in February. I know these pictures do not fully capture it, but I love finally living where we can see a full skyline and feel the fullness of the earth. I'll let you all soak in the beauty and then decide which is the most beautiful! As I clicked through them, I thought each one was more beautiful than the next and simply could not decide myself. SE Michigan feels like Seattle in January or our first trip to New Zealand during their late winter/early spring months - in the 50's, rainy or misty, windy, and gray skies nearly every day. Better than winter in Michigan for sure, but honestly, I am tired of continuing to put away and then pull out my winter coat and gloves! However, the birds know it is spring and they are coming right on time and cheering up my day. 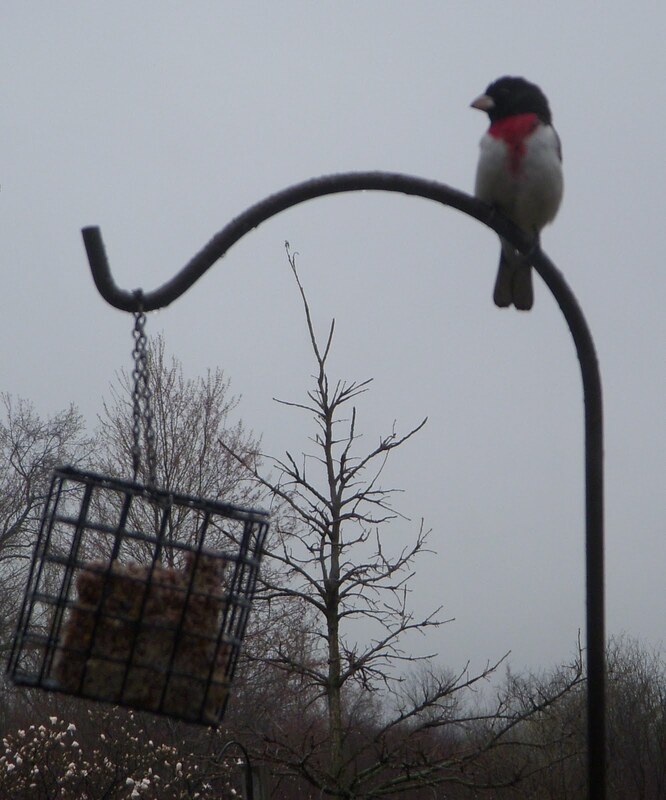 Tonight I changed the photo heading my blog to show one of my all-time favorite birds, the rose-breasted grosbeak sitting on top of a pole holding suet, giving me a great view of his rose-colored feathers on his chest. With the white and black contrasting patterns, his coloration is stunning, in fact just drop-dead gorgeous, even and maybe especially because of the contrast with the gray skies! He has found a female who is also visiting the feeders, and sometimes I even see them together. So I am hopeful they will nest in our woods and bring their babies to the feeders later in the summer. I love having events to look forward to. Beauty, beauty, beauty! Birds bring beauty into my life, no matter if it is sunny or cloudy, but seeing such striking colors on such a dull-colored day plus hearing them sing brings me both happiness and hope, which I feel as a lift to my heart. I am reminded of Emily Dickinson's famous poem Hope. Usually I see it on a card or a plaque in a shortened format. Here it is in its entirety. I believe that those who have experienced deep fear, pain, or loss from cancer (or other ways) can truly understand and feel hope as far more than just a word used casually in a sentence (i.e., I hope the sun comes out today). I also think such people look for and feel beauty in ways that others don't. I had that experience today, with both this rose-breasted grosbeak this morning and unexpectedly hearing a violin being played this afternoon. Beauty is in the eye of the beholder of course, and what is beautiful to each of us is certainly very different and should be unique and special. I hope (and I use this word with deep feeling) that each of my readers has beauty and hope in your life on a daily basis, beauty of such exquisite character that it also brings you to tears with no explanation really needed. Such an experience is certainly evidence of being alive, whether you are 'in the chillest land' or high on a mountain top. What I will experience tomorrow? I wonder what you will experience tomorrow, too. Good night! I saw what I thought was a brown paper grocery bag in my peripheral vision on the farm yesterday morning just past our small field of hops. Wondering where that blew in from, I trotted over to 'clean up'. However, it disappeared right before my eyes, which seemed strange! Well, now I was really curious and that brown bag was clearly something to check out. Before I knew it, I had nearly stepped on this fawn, which must have been only a day old or less! We certainly won't cut the grass in this area, but of course, I wonder how many other fawns are lying in plain view, sort of, instead of hidden away in those thickets of my youth, compliments of the movie Bambi! I was not nearly as close to this fawn as these photos seem. Except for that one time I almost stepped on it, I was at least 10 feet away, trying desperately to zoom the lens on my little camera, see the fawn in the viewfinder, and keep the camera steady, not an easy feat. The mother was never in sight, but I cannot imagine that she was far away and was likely clearly watching us! I keep my eyes open as every day there is something new on the farm! Now a newborn fawn is a sure sign of spring and getting those fences built for our family garden will be the next job on the list (after we get fully moved with our 'city house' listed for sale!). Today I worked at making our enormous compost pile at our Ann Arbor home look like a 'feature' (i.e. reduced in size and tidy) for potential buyers. We started our compost pretty quickly after moving to Ann Arbor in 1987. We attended it, turned it, added to it, turned it, used it, added to it, replaced the pallets that contained the two bins on the sides and the bottom several times, used it, added to it, invited our neighbors to add to it and use, and on and on. It has been an on-going part of our life, our yard, and our gardening efforts for 20+ years. Right next to it are two cottonwood trees. In the spring of 1988, my older son was looking out of his second-story bedroom window during a thunderstorm to see lightening strike one of those cottonwood trees and blow the top right off, nearly at eye level about 40 feet away. To say that was exciting (i.e. maybe even electrifying!) for him would be an understatement. What to do, what to do with that tree? Well, we cleaned up of course, picking up the branches and other debris, but the bigger question was whether to cut it down. I voted to keep it up as I have always wanted to have a 'woodpecker tree' (i.e. a dead tree!) in our yard providing both a food source and a potential home for woodpeckers. 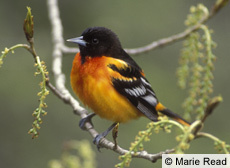 Most people cut down dead trees right away for the 'tidy factor' and the 'safety factor', which I can understand, but here we had a chance to provide this special habitat for such beautiful birds, most of which stay year round in our part of the country, and need trees that provide both food and home sites. While good in theory, I can't say that my idea was particularly successful. I'm a pretty faithful bird-watcher and bird-feeder and know what birds are in my yard year round, and I would not be able to truthfully say that the tree was a woodpecker magnet. Until today! While working at the compost pile this afternoon right next to the dead cottonwood tree, I suddenly heard a jackhammer in my head!! I looked up to see a downy woodpecker giving our dead cottonwood tree a very enthusiastic hammering about 10 feet above me. Our son was 10 in 1988 when lightening struck that tree and I had the idea to keep it up for a woodpecker tree. He is now almost 34 and getting married in a few weeks. Wow, it was a long wait for a fabulous woodpecker experience, but definitely worth it! That male downy woodpecker gave me a great view of him from the underside, as I was being showered with teeny tiny wood chips, definitely a new experience for me. The next owners of our Ann Arbor home can decide what to do with that dead tree, but I hope they keep it and also use the remaining compost. Back and forth, back and forth between our 'city house' and the 'country house'. I brought back another load of important stuff this morning and got it put away at the farm. The city house is still quite smelly from having the hardwood floors refinished and also difficult to navigate without walking on the floors until the new finish is fully cured in a few more days. My husband loaded up all the old TV's and other old electronic equipment on our trailer (both our stuff and 'city house' neighbors' stuff, too) to take to the community computer/etc recycle day. I don't know what else he did at our city house to get it ready to sell. There is a long list of 'little things'. Because there is so much to do in both places, we often are working in parallel instead of together. However, my husband and I did work together this afternoon to do a second harvest of our green garlic, this time specifically walking the fields looking to find where we accidentally planted double cloves. All those we saw were dug up and cleaned up to sell to Zingerman's Deli and/or The Grange Kitchen and Bar early next week. If we leave those doubles (and an occasional triple) in the ground, neither clove will develop into a full head of garlic because they are too crowded. So right now they are just perfect to use as green garlic, and the local chefs just love having us bring it to sell. A friend came over to take back the honey extractor she had loaned us last year along with some of my 'stuff' that she is using to teach her 5th graders about Alaska. The two of us enjoyed sitting for a while on the bench on our front porch to watch the birds come into our feeders. No windows changing the view or diminishing their sounds! Some birds are skittish but most get used to me sitting there outside now that the weather is warm enough to do so. Next as my husband cleaned up some shelves that someone is coming to get to take away (via our local 'freecycle'), I swept out part of the garage to help make the shelves easier to see and get out. Cleaning out and organizing the garage at the farm will be a long process, but step by step, we'll be able to walk through there (someday even park our cars inside) and know where things are. I dug up all the invasive garlic mustard I could find (mercifully we have surprisingly little of this horrible invasive plant). I also walked into our woods for the first time without Kaya and was shocked to see how many of our dead ash trees came down this past winter. The path was literally covered with a mish-mash of downed trees. It looked like someone had thrown the sticks in a game of 'pick up sticks'. It was hard for me to pick my way into a small section of our woods. It would have been impossible for Kaya to do so with her lame back legs. I took that opportunity (now that I was in) to pull baby buckthorn trees (another horrible invasive plant) in one little section of the woods under some impressively large oak trees. I had a huge armload, which I carried out to the burn pile. Underneath all the baby buckthorns I found many native wildflowers, including spring beauty (blooming), trout lily, may apple, and solomon's seal. I hope I gave them a better home, a chance to thrive again, even if it is just a little space. Tonight I'm going to call my mother, get out my iPod and listen to warbler songs, have a glass of wine, and go to bed. Tomorrow morning (if not raining), I'll initiate my long-standing (34 years!) Mother's Day tradition here on the farm, which is to have an hour by myself to go birding during the peak of migration season. Birding with a baby or toddler in a back-pack or a front-pack can be done (and I have done it with both boys), but I'll confess that 'serious' birding is far more enjoyable and easier without that extra weight and distraction. Some years my husband played with the boys while I took my hour or so alone, and some years as the boys got older, we planned a day to drive out to a nature sanctuary to take a nice walk as a family. Both were the perfect Mother's Day gifts for me! I have been a very fortunate woman to be able to be a mother. The friend who came over today did not know I am a childhood cancer survivor in addition to my other cancer diagnoses. Nothing about being a cancer survivor is easy, and that goes double, maybe even triple, for being a childhood cancer survivor. Without going into detail, just suffice to say again that I know that I am fortunate in addition to being grateful for the opportunity to be a mother. I have been able to raise two sons all the way to being young adults. Each is an incredible human being, and both give me hope for the future our world. I am pretty sure that today was my first day to spend ALL day at our farm, from waking up in the morning to right now, about 8 pm, and I am not going anywhere tonight except to bed! I often meet two special friends on Wednesday mornings, but they both needed to spend the time elsewhere this morning. Our Ann Arbor Wednesday Farmers' Market started today, but even that did not entice me to want to drive all the way into town. I could have been doing something (anything) at our other house to finish sorting and moving stuff out, but the hardwood floors are being sanded and stained right now so the noise and smell in the house is awful. I could have/should have done many other things, too, that would have taken me away from the farm. Instead, I got up early, checked to see if any deer were hanging around the house, checked the bird feeders, filled up the feeders, scrubbed out the bird baths and filled them up, did my exercises to strengthen my forearm muscles to help with the healing of my sore tendon on my inner elbow (called golfer's elbow or medial epicondylitis, although I don't golf and this injury likely came from all the painting and scrubbing I did at the farmhouse over the winter). I made a smoothie for breakfast, had a shower, actually wiped down the tub and walls, answered some email, watched the eagles on the Decorah, Iowa webcam (I confess, I am a fan and love watching the three eaglets behavior and their growth), found and cleaned our hummingbird and butterfly feeders, made some sugar water, filled them and hung them up. A male ruby-throated hummingbird was there flashing his gorgeous throat in the sunshine (yea - sunshine!!) within minutes. I sorted some stuff in my office, sorted some of my clothes (very little is organized yet), made some necessary phone calls, and then made a real lunch for me and my husband who was home by that time wet and freezing cold because the hose broke and somehow turned on him as he was doing some outside work at our other home to finish getting the yard ready "to show" when the house goes on the market. After lunch, I finally planted the 8 baby spruce trees that my brother and I dug up at our other house (all volunteers in our yard from a neighbor's tree). So far, they are only planted in a nursery since we really don't know where we want them permanently. I also transplanted 3 columbine plants we also dug up and brought to the farm, all volunteers and in spots that did not look 'tidy' at our house soon to be put up for sale. Next, I went to help my husband harvest our green garlic, which is the earliest garlic of the season. Green garlic is the early green garlic shoots with the clove that was planted last fall, all dug up together, washed and cleaned up. It is rarely seen in grocery stores (maybe a well-stocked Asian grocery store), but chefs love to use it in various ways, and you will occasionally see it at a farmers' market. The garlic taste of green garlic is very mild, and we have found that you get the most 'bang for the buck' in terms of garlicky-ness when it is simply chopped and used raw such as mixed into any type of a salad, blended into a salad dressing, sprinkled over a stir-fry or scrambled eggs, mixed into the ricotta cheese for manicotti stuffing (heated a little, but not at a high temperature of a stir-fry), as just a few examples. If you do find it for sale at a market, don't be too surprised at the high price. By harvesting the garlic now as the 'green garlic', we are sacrificing the plant that would produce a whole bulb or head of garlic later in the summer. After spending the afternoon with all this transplanting and harvesting, we were both whipped but very satisfied. Tonight is the start of doing daily farm clothes washing! My husband will take care of washing all the green garlic and preparing it for our local chefs. We will keep and use the really tiny stalks, at least some with dinner tonight. It's 8:30 now and time to make supper. My husband has changed clothes (I did that earlier) and is cleaning the green garlic in our triple sink while watching hockey in the basement. Supper will be something simple like a tofu stir-fry with Swiss chard served over brown rice and sprinkled with chopped fresh green garlic, toasted Naan bread and hummus and olive oil, followed by some frozen yogurt and stewed rhubarb (we need to use up last year's canning as the rhubarb crop will be coming soon!). We'll be in bed before 11, up before 7, and maybe even during the night too if my husband hears the coyotes again like he did last night (I slept through the whole episode). A day on our farm. As I said, it was a very satisfying day. I cannot wait until we are here full time. I don't mind going into town to run errands, and I love going into town to meet friends, but I'm weary of splitting time between two homes and completely ready to just have one home to settle in with my mind, body, and spirit. My husband and I were recently (only somewhat) joking about the constant full-speed pace we have been on for the past two years, hoping that pace did not lead either of us to an illness or running away to the sea to be a sailor like Piglet did (or at least talked about) in one of the Winnie the Pooh books. Staying on the farm for a day, harvesting the green garlic, and putting up the hummingbird feeder all sound like 'doctor's orders' to me. I'm glad I listened to my own inner wisdom without needing doctor's orders to take care of myself and finally take a day to enjoy our farm. PS - I missed my dog Kaya a lot this afternoon, realizing that when outside working, I am always looking at or for her, wanting to know exactly where she is (wondering if she is lying down and squashing something) while I am weeding, harvesting, etc. So I had another 'first', my first day of working outside on the farm without her. Our plan is to start thinking about getting another dog sometime after our older son's wedding in June. I want to be able to focus on a new dog and have that dog know its home, without the intense chaos of back and forth between these two homes like we have had these last two years and especially these last several months. I should have anticipated missing Kaya in this way, but I have been too busy and too tired to do so, which made the sudden awareness all the more poignant. While running multiple errands in the car this morning, I had a chance to hear most of a radio interview with Alice Walker (author of The Color Purple and her new book The Chicken Chronicles ) as she spoke about 'life's lessons' she has learned after recently beginning to care for her own backyard chickens. In addition, when I got home, I saw the Washington Post article Why Being a Foodie Isn't Elitist, written by Eric Schlosser (author A Fast Food Nation ). Each author uses different words but is conveying the same message, which is (I'm using my own words now) 'to think about and care about the source of your food and to value the life (lives) sacrificed for your nourishment'. I want to listen to Alice Walker's interview again, so I'll get out my Christmas i-Pod and (again) figure out how to download a podcast. The blessing that my husband and I frequently say before meals gives thanks to all life and all hands involved with bringing our food from farm to fork. Eric Schlosser and Alice Walker help us remember to not only be grateful for our food but both thoughtful and compassionate, too. Each of us is voting multiple times per day for the world we wish to see with the choice of the food we purchase, grow, and eat. I am voting for 'good food for all' as many times as possible. I am not exactly sure what a 'foodie' is or if I consider myself to be one, but by no stretch of the imagination do I consider myself 'elitist'. I am voting for the common good.